On March 10th National Academy of Internal Affairs hosted the roundtable discussion of joint German-Ukrainian project for developing the updated system of NPU staff training. On April 4, 2019, the rector of the National Academy of Internal Affairs Volodymyr Cherniei, together with the Head of the European Union Consultative Mission in Ukraine, Kęstutis Lančinskas had a meeting with the Academy's students. From 12 to 15 March 2019, a course on Integrity during Peacekeeping Operations was held under the auspices of the NATO Integrity Initiative. On March 29, 2019, at the National Academy of Internal Affairs took place a working meeting between the Academy leadership and representatives of the Council of Europe. On February 22, 2019, the National Academy of Internal Affairs awarded certificates on the successful completion of the training on ensuring the public order. On November 28, an international scientific and practical seminar "Innovative Methods of Instrumental Detection of Lie" was set up at the National Academy of Internal Affairs. The seminar program is scheduled for three working days. 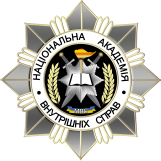 On November 12 the National Academy of Internal Affairs opened the 9th module of the Program. Among foreign participants of the event: Main Program Manager Ove Urup-Madsen (Kingdom of Denmark); UK Deputy Special Defence Advisor Robin Seaword; Professor of the UK Emergency Planning and Response College Roger Gomm, and other specialists. The second day of the round table was concluded with the participation of: the Italian delegation; representatives of the Ministry of Internal Affairs of Ukraine; National Police of Ukraine; Prosecutor General's Office of Ukraine; Ministry of Finance of Ukraine; State Fiscal Service of Ukraine; and other state institutions. The National Academy of Internal Affairs launched a round table within the framework of "Cooperation project 2"
Today at the National Academy of Internal Affairs a round table, which will last for two days, has been launched.